At 3pm of March. 24th, 2015, the 9th floor conference room of Modern Cancer Hospital Guangzhou was so crowded, since the monthly anticancer warrior award ceremony would be held here. 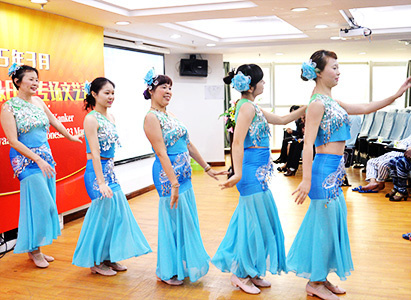 It is known that the hospital would also prepare song and dance performances for the patients, for encouraging them to fight against cancer optimistically. 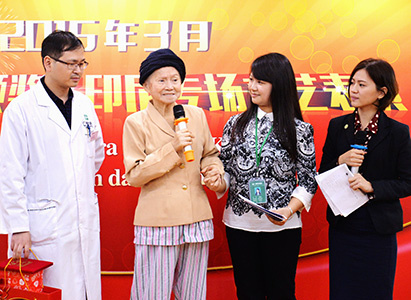 The ceremony was launched at 3:00pm, on which Dr. Huang Junqiang, oncologist from Modern Cancer Hospital Guangzhou issued certificates and gave nourishment to the anticancer warriors. Dr. Huang also encouraged all the present patients to learn from the warriors and never give up in fighting against cancer. As March's monthly anticancer warriors, Kho Siong Lie, liver cancer patient from Indonesia, Elly Kristina, ovarian cancer patient and Wong Nyuk Fah, prostate cancer from Malaysia have said that maintaining a good attitude is the key to fight against cancer . To believe in the doctor and to actively cooperate with treatments will make a success. After the award ceremony, medical staffs from Modern Cancer Hospital Guangzhou specially presented performances for all the patients. Among which, Happy Songkran and Bengawan Solo was especially welcomed. 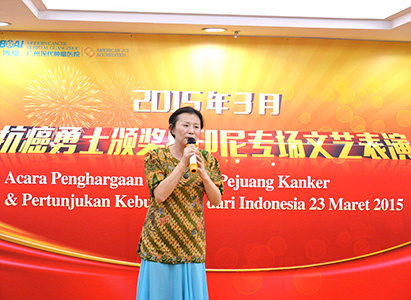 As one of the Indonesian's favorite songs, Bengawan Solo was sung by Dr. Cao Chun from the International Clinic. All the present Indonesian patients were humming together with Dr. Cao, which made the scene in a warm atmosphere. Many patients expressed it was very touching that the medical staffs in the hospital would like to take off time after work to do the rehearsal & performance for them. Peng Xiaochi, Oncology Director of the hospital considered that patient's state of mind is closely related to the occurrence, progress and metastasis of cancer. The hospital regularly organizes this kind of activity provides a platform for patients to share anticancer experience, which also helps to release their press, spread happiness and conduct to good health.